These days, tooth decay doesn’t have to leave you with a noticeable silver filling. 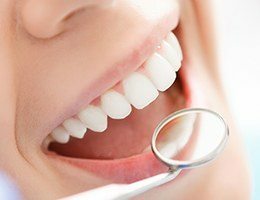 If you have a new cavity or are embarrassed about the appearance of an old filling, we’ve got good news for you: Tooth-colored fillings can restore the health of your tooth without marring your smile’s appearance. Made out of biocompatible composite resin, tooth-colored fillings are a natural-looking, effective alternative to silver fillings. Dr. James Olsen is happy to offer tooth-colored fillings in Ann Arbor. Tooth-colored fillings, also called white fillings, fill the hole, or cavity, left by tooth decay. They are made out of a composite resin mixture of smooth plastic and glass particles. Composite resin is a biocompatible material that is highly customizable to match the shade of your surrounding tooth enamel. How do tooth colored fillings compare to their silver, or amalgam, counterparts? The most significant difference you will notice is in their appearance. White fillings blend with the surrounding teeth, while silver ones are highly visible against the tooth enamel. Tooth-colored fillings also dry much more quickly than silver ones. With the application of a special UV light, a white filling can dry in mere minutes. A silver filling, on the other hand, may take up to 12 hours to fully set. Tooth-colored fillings also require less removal of the healthy tooth structure, leaving more of your tooth enamel intact for more conservative dentistry. Compared to silver fillings, the advantages of tooth-colored fillings are significant. They are now the most popular method of restoring teeth from tooth decay. Just like tooth-colored fillings can fill a new cavity, they can also take the place of old, silver fillings. If you are tired of flashing a mouth full of metal every time you laugh, or if you are worried about the potential risks associated with silver fillings (mercury exposure or hidden decay and breakage), then you may want to consider a filling replacement. Contact our office to discuss the need for replacing your fillings. It is a simple procedure usually performed in just one appointment.